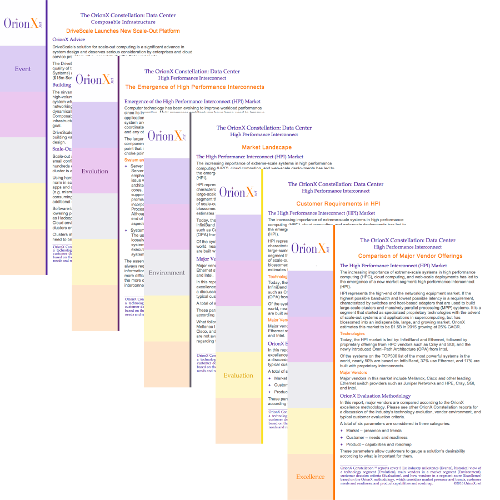 The OrionX Constellation™ research reports and diagrams analyze technology innovations in growth markets and are part of a unique model that integrates content, context, and dissemination. Whether tactical or strategic, bold or conservative, or focused on now vs. the future, customers’ evaluation and adoption of technologies is a complex process. A typical RFP makes this evident. 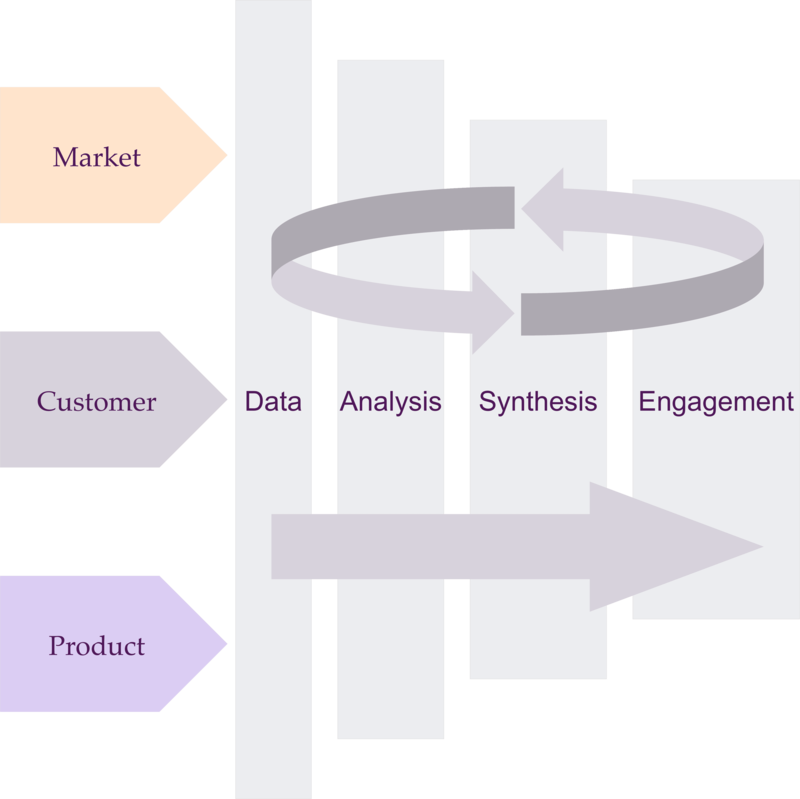 Following the proven OrionX strategy model, the Constellation process collects and organizes data in three categories: market, customer, and product. The data is analyzed to identify salient points which are synthesized into the coherent insights necessary for effective engagement. 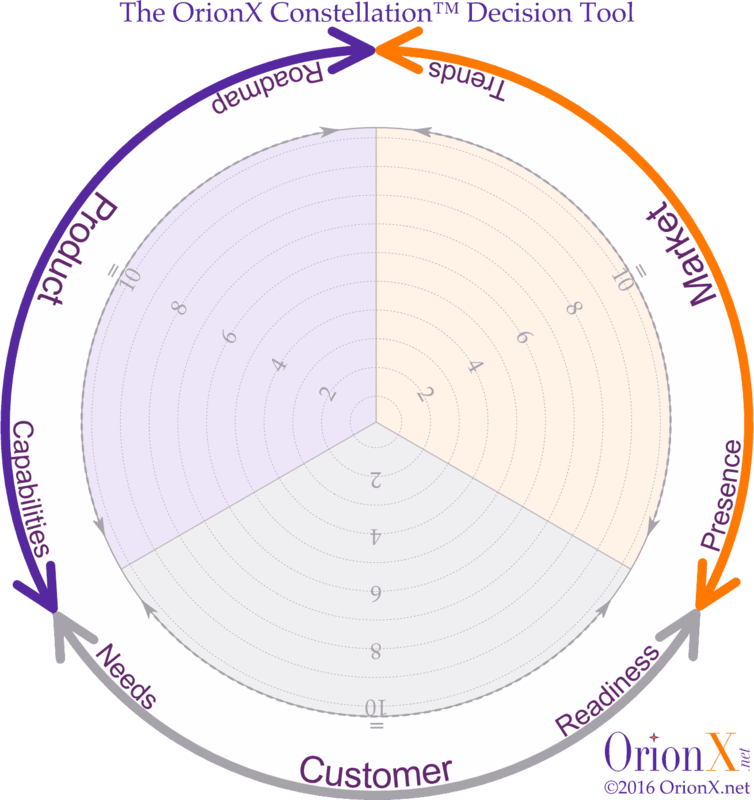 The OrionX Constellation Decision Tool effectively visualizes the six parameters that capture the core of technology customers’ selection process. Each of the six parameters is scored from zero to ten. The two parameters in each category (Market, Customer, Product) are averaged to produce a single score for that category. The placement of this score on the Constellation graph depends on which parameter is stronger. The following reports are available for download. Please click on the image to go directly to the full report. No registration or payment is required. We provide our views of the cryptocurrency economy in the next 9-15 months and review the accuracy of our last outlook from last year. Topics that are covered include Ethereum and Smart Contracts, Bitcoin and Lightning, Security Tokens, Stablecoins, Enterprise Blockchains and Distributed Ledger Technology, Cryptocurrency Phones, Messenger Coins, and Retail Killer Apps. We begin with definitions and a glossary of terms. The CryptoSuper500 list tracks supercomputers that are used for cryptocurrency mining, an intensive application that has become a driver of technology development and investment decisions globally. The growth of the cryptocurrency market has put the spotlight on emerging decentralized applications, the new ways in which they are funded, and the software stack on which they are built. Cryptocurrency technologies include blockchain, consensus algorithms, digital wallets, and utility and security tokens. 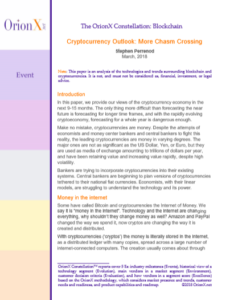 In this paper, we provide our views of the cryptocurrency economy in the next 9-15 months. The only thing more difficult than forecasting the near future is forecasting for longer time frames, and with the rapidly evolving cryptoeconomy, forecasting for a whole year is dangerous enough. Make no mistake, cryptocurrencies are money. Despite the attempts of economists and money center bankers and central bankers to fight this reality, the leading cryptocurrencies are money in varying degrees. The major ones are not as significant as the US Dollar, Yen, or Euro, but they are used as media of exchange amounting to trillions of dollars per year, and have been retaining value and increasing value rapidly, despite high volatility. A rare look inside and a fascinating glimpse into how real world customers evaluate, test, and make decisions between different server technologies. We examine a major server refresh at the World Bank. We were fortunate to receive data directly from the bank concerning their needs, the server alternatives they evaluated, their evaluation criteria, the results of their analysis, and, of course, their final decision. Almost every business is now data driven and many are realizing that their data is one of their most valuable assets. But how well are they protecting that data from IT problems that can cause data loss? In this report, we discuss the value of data and take a look at a readily available solution designed to protect against data loss. Here is our Top-10 Data Center Predictions for 2017. Multi-processor architectures have been used to improve application performance since the 1960s which has significant impacts upon system and software design as well as the orchestration required to coordinate communication between processors, memory, storage, networks and any other component that affects workload performance. The larger or more complex the workload the more important it is that the components of the system are well balanced and do not create a choke point that impairs expected performance. 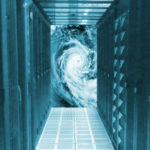 One of the most important components of a high performance computing solution is the interconnect that ties the resources together. In fact, interconnect speeds have advanced at a rate of 30% annually over the past four decades. This compares well with Moore’s Law, which indicates 41% annual improvement. Thus the increase in interconnect performance has had, and will continue to have, a large impact on the performance of high performance systems. Major vendors in this market include Mellanox, vendors with an exclusive focus on Ethernet such as Cisco, Juniper Networks, HPE, Brocade, et. al., and Cray, SGI, and Intel. 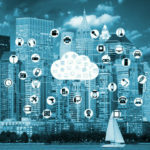 With increasing adoption of scale-out architecture, cloud computing, artificial intelligence, and extreme-scale processing, High Performance Interconnect (HPI) technologies have become a more critical part of IT systems. Today, they represent their own market segment. In this research report, we examine key evaluation criteria for HPI technologies. How do customers select a technology and a vendor? What are the key issues and tradeoffs? How does one match a given workload to an appropriate interconnect and topology? From a market share perspective, the HPI market is currently led by: InfiniBand and Ethernet, followed by proprietary offerings from HPC vendors such as Cray and SGI, and the newly introduced Omni-Path Architecture (OPA) from Intel. As a proxy for the HPI market segment, the TOP500 list of the most powerful systems in the world provides a glimpse of market dynamics at the very high-end: over 40% are based on InfiniBand, 44% use Ethernet, and 15% are built with proprietary interconnects. However it is worthwhile to note that only five of the TOP100 systems are Ethernet-based, and the highest is ranked in the 74th position. DriveScale’s solution for scale-out computing is a significant advance in system design and deserves serious consideration by enterprises and cloud service providers alike, especially for Big Data workloads. The DriveScale team’s record of innovation and execution, together with the quality of the company’s early customers (AppNexus, ClearSense, and DST Systems) and partners (Foxconn), and the level of funding it has received ($15m Series A) position it well for the market. Here at OrionX.net, we are fortunate to work with tech leaders across several industries and geographies, serving markets in Mobile, Social, Cloud, and Big Data (including Analytics, Cognitive Computing, IoT, Machine Learning, Semantic Web, etc. ), and focused on pretty much every part of the “stack”, from chips to apps and everything in between. Doing this for several years has given us a privileged perspective. In this report, we capture some of the trends in Data Center technologies.